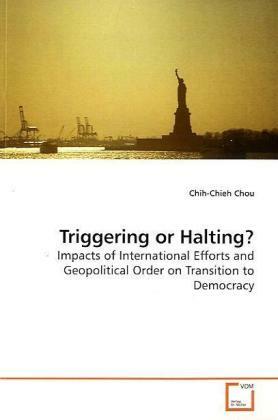 This study examines the international effects on democratization through a cross-regional comparison between Taiwan and Hungary. The findings firstly show that Both transitions were initiated by the unfavorable geopolitical climate (erosion of U.S. diplomatic support) or the lifting of outside pressure (the Gorbachev factor). In the consolidation period, while Hungarian democracy still relied on a stable near-abroad order and adaptation to the conditionality set by the EU and NATO, Taiwan s political development and future were heavily determined by the US security support and the interactions between Washington and Beijing. Second, international efforts could be regarded as an explanatory variable for emergence or survival of a democracy rather than a contextual variable situated at the macro-level of a given system argued in previous studies. Third, as ignoring by current literature, the distinction between favorable/unfavorable external factors strengthens the explanatory power of the influence of external actors on democratization, especially in accounting for impact of external threats and timing of political liberalizations. Bitte schreiben Sie uns Ihre Meinung zu: Triggering or Halting?